Witnesses in the Democratic Republic of Congo, DRC, say gunfire has erupted near the home of the nation's former vice president, the scene of a standoff between the military and soldiers loyal to the former rebel leader. 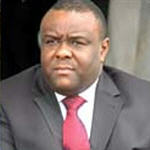 The witnesses report heavy weapons fire Thursday around the home of Jean-Pierre Bemba. It was not clear whether U.N. peacekeepers deployed to the area on Tuesday were involved in Thursday's fighting. The standoff began several days ago after the government ordered a return to barracks for soldiers serving Jean-Pierre Bemba and another former vice president. Bemba and his guards opposed the order. They said a team of 12 police officers assigned to protect him was insufficient. The troops remained there on Wednesday as U.N. representatives urged the two sides to resolve their dispute. Bemba lost Congo's presidential election last year to the incumbent, Joseph Kabila Bemba was a rebel leader during the DRC's civil war, which killed some four million people.